Home » Bike Reviews, News & More » Bikers Classics – Lucky Thirteen! The visitors of the thirteenth Bikers’ Classics were hardly given time to catch their breath. They were treated to a scorching action packed weekend. And those who chose to skip a few Parades or races, could enjoy themselves in the Lifestyle Village or at the auto jumble. The classic race event at Spa-Francorchamps once again lived up to its name of offering something for everyone. 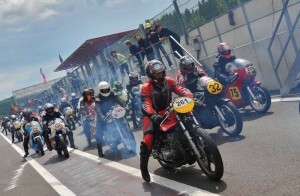 This year the Bikers’ Classics symbolically opened a Lifestyle Village. It proved to be a big success. Yamaha presented its so-called Sport Heritage bikes, Ducati featured the customizing talents of world famous Fred Krugger and his self-built Scrambler and at Harley-Davidson visitors could experience the thrills of a stomping Milwaukee twin. Outside the paddock visitors enjoyed the usual good atmosphere at the ‘auto jumble’, where many were in search of that one spare part, that special shirt or that exclusive book. The Ducati Owners Club and the Kawasaki Z1300 Club welcomed its members. The Laverda clubs were well represented by members from as far as Denmark, France and Germany. In a crowded tent, many exclusive Laverda singles, twins and triples were put on display, while Laverdisti lined up for an autograph of Laverda racing legend Augusto Brettoni. 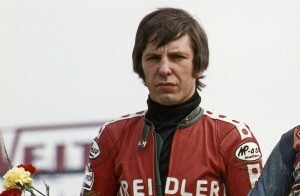 The indisputed star of the show, however, was the Laverda V6 Endurance racer. In 1978 the orange V6 impressed with its enormous power of 140 bhp and topspeed of 283 km/h at the Bol d’Or. At Spa-Francorchamps its 1991 version made for big smiles and applause every time Dutch builder Cor Dees fired it up. Moments of silence were rare at Spa-Francorchamps. The track was not just flocked by riders during the Parades; some 550 trackday riders also enjoyed their time on the 7 kilometer long circuit. But of course the Spa-Francorchamps circuit was used for true racing as well. 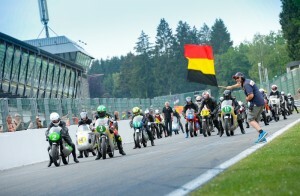 The German Kaiser Classic Endurance Team won an evenful 4 Hours of Spa Classic on Saturday evening. It was the team’s second win in three years. Pole sitter Dirk Schnieders dominated a sixty rider field in the CSBK Masters Series in both races on his Yamaha FJ1200. Paton mounted Dario Tosolini claimed the double in the two BCGP-IHRO races, whereas Richard Blunt grabbed two wins in the Pro Classic class.